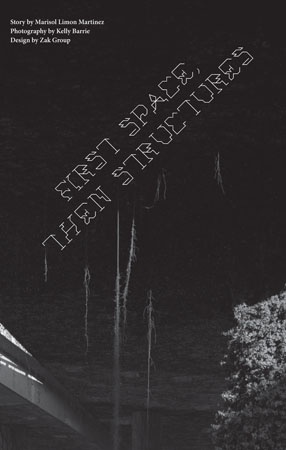 First Space, Then Structures, a combination of allegory and science fiction, is comprised of one story told by four women. The centerpiece of the book is the notion of The Impossible Light- an ethereal entity created from architecture at the beginning of time that continues to unify as well as divide human beings. The recollections of the women, both disjointed and collective, take the reader back in time, to the very distant future, to varying psychological and geographical spaces including blissful ignorance, barren deserts, post trauma breakdown, and futuristic cities filled with fragments of luminescent skyscrapers. The narratives shift from one character to another . The story begins with a girl who plays piano in a glass elevator.